Reaper has been a mostly forgotten hero, not finding a foothold in any recent meta in the last two years. He's been a niche pick generally, played on maps like Temple of Anubis or primarily used to harass supports and the backline. A hero with high damage sustain at close range, he simply was too easy to counter with good team play and hero counter-picks. The Overwatch team has been slowing buffing Reaper and other heroes over the last several patches, in what appears to be an attempt to make more heroes viable for competitive play. 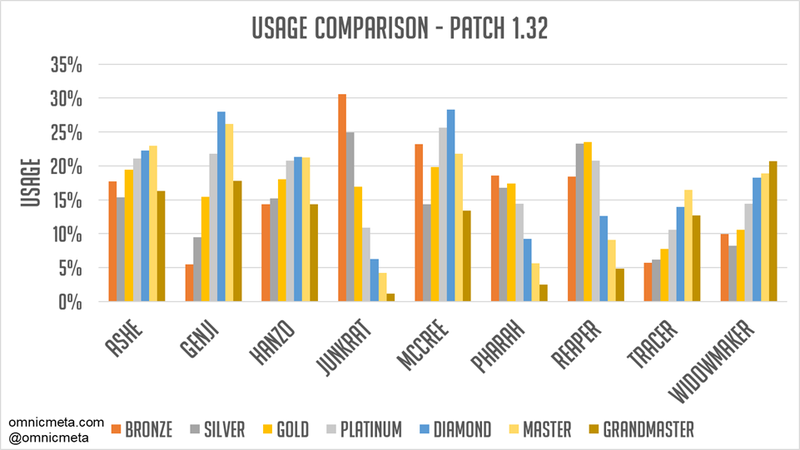 Patch 1.32 had an armor nerf which affects most tanks, and a Reaper buff to his self-healing - giving him more sustain. Check out the patch notes if you want more details. 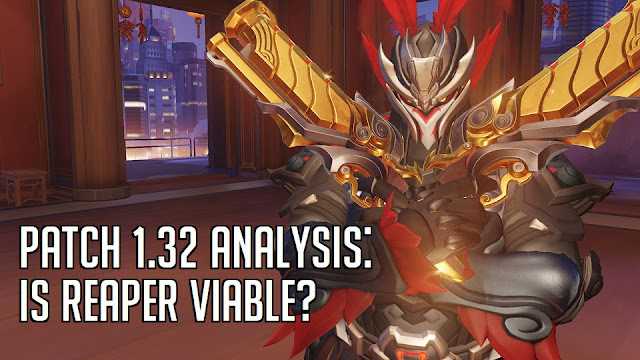 In this article we dive into the new Reaper using real game data - a week's worth of player data constituting more than 68,000 PC competitive matches for Reaper. As always, enjoy! Did you know that you can look up your Player Stats on OmnicMeta? Click here to check it out! Reaper's selfing healing increased from 30% of damage done to 50% of damage dealt. How has this affected his presence in game? The above chart compares Reaper's seal healing in Patch 1.31 and Patch 1.32. On average, Reaper see a 61% average increase in healing per 10 minutes, which is quite close to the expected value (30% -> 50% is a 66% increase). As we'll see, this buff appears to translate to him being able to be much more aggressive offensively. Reaper was already one of the deadliest heroes in the game and one of the top at dishing out raw damage (along the likes of Junkrat, Pharah, and Hanzo). With the self healing change (and the armor nerf), Patch 1.32 has improved his in-game effectiveness considerably. The chart above shows that Reaper's stats per 10 minutes are up: Eliminations up +3% on average, Damage done up +5% on average, and Final blows up +3% on average. Death Blossom Kills have increased more than 15% on average, which is likely due to a number of factors: being a Ana Nano target, Surviving during the ultimate with better self healing, and charging ultimates more quickly using self healing to enable more aggressive play. While Reaper is still limited and nearly one-dimensional as a hero (raw offense at close range), the self healing buff appears to be a much bigger change than some may have expected. As we turn to looking at Reaper's impact on the meta, the self-healing (and armor) changes have also greatly impacted his usage and winrate. In the following charts we compare Reaper to the most popular Damage heroes being chosen in competitive. As you might expect, Overwatch players seem to have taken to the Reaper change overall. His pickrate is up +10% across the tiers, with the tiers below Diamond having the largest increase. I attribute better coordination and ability to counter to Reaper being adopted less at the Higher tiers; it's also worth mentioning the popularity/prevalence of GOATS compositions at Grandmaster in particular (where there simply isn't much room for Reaper). Reaper is nearly a one-dimensional character after all - and with skilled ranged heroes (Ashe, Widowmaker) and good support play (Ana Sleep Darts, Brigitte Shield Bash, etc), it's simply much harder to play Reaper. On the whole, Reaper is now being played in 1/5 of all game playtime at the lower tiers, making him one of the popular Damage heroes at those tiers. 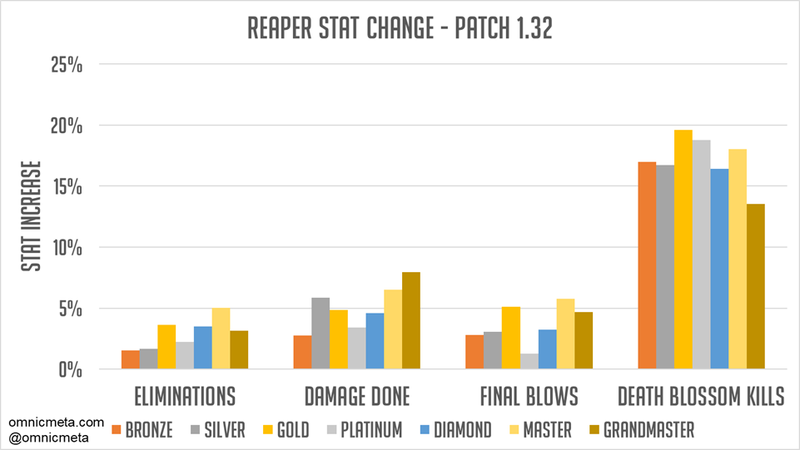 Reapers winrate has increased quite a bit as well. He's at or near the top of all popular Damage heroes at all tiers, of play, sporting some very impressive winrates. 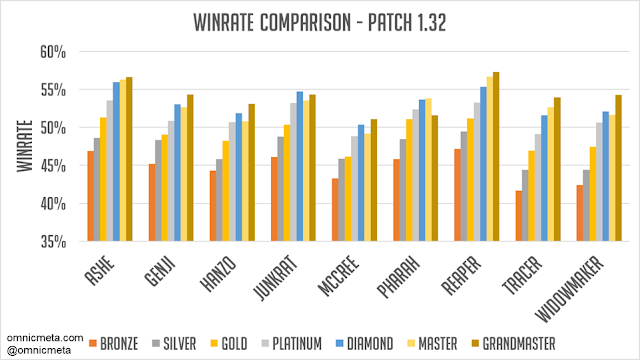 For example, in Gold tier Reaper has nearly a 52% winrate - quite impressive. His success scales with the tier as well, reaching a 57% winrate at Grandmaster. Overall, Reaper's winrate has surged +5% on average across the tiers - meaning that this patch (and meta) has made Reaper viable for the first time in a long time. 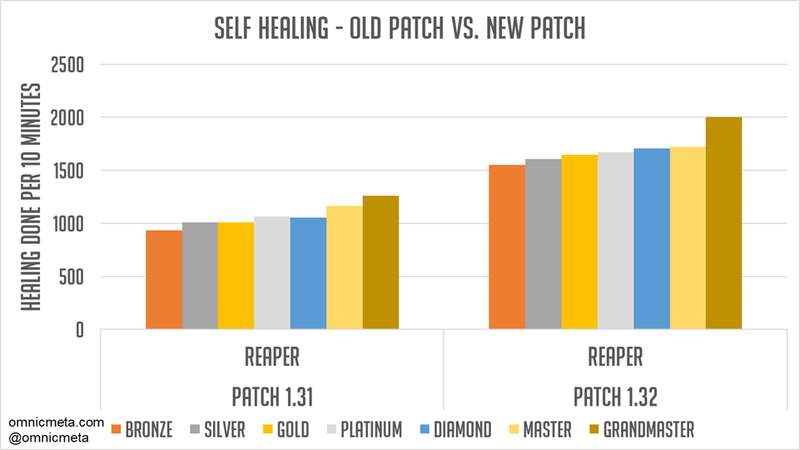 The self healing buff to Reaper in combination with the armor change and meta appears to have finally pushed Reaper into a somewhat viable state. His offensive capability is up across the board, including a huge increase in his Death Blossom effectiveness. As the result, players have started playing him much more widely, and his winrates have skyrocketed. Reaper still has maps, hard counters, and other situations that can make him unfavorable and a niche pick, but my take is that Reaper in his new state is worth playing.